Needing to add some style to your routine? 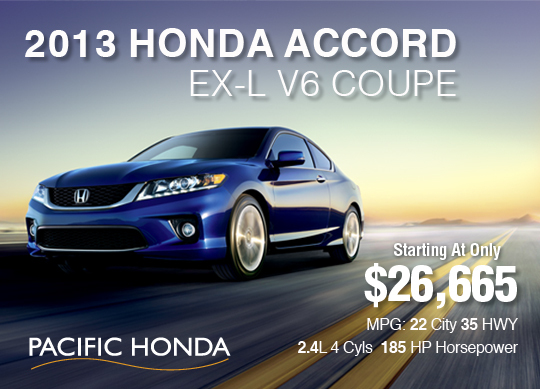 Come down to Pacific Honda and check out one of the highest rated rides for 2013. The all-new Honda Accord EX-L V6 Coupe combines the style and power you want to make your commute a happy one. 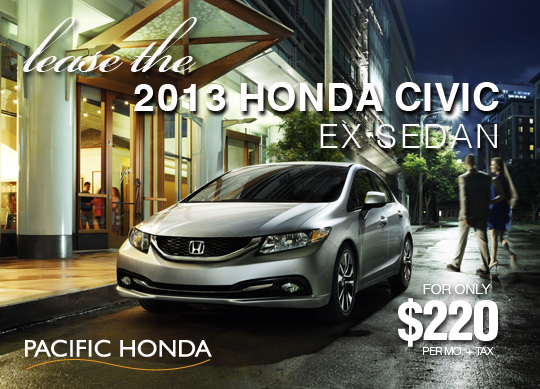 Come by Pacific Honda and test drive yours today! 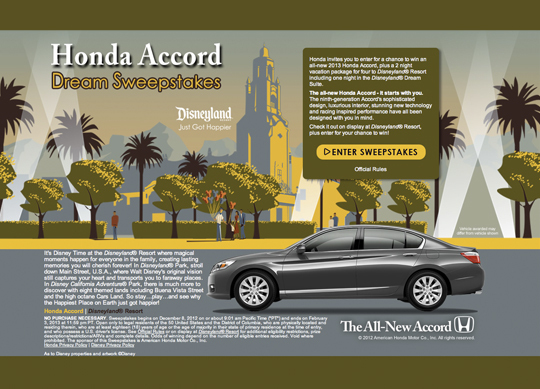 Your friends at Pacific Honda want to make sure you know about your chance to win the all-new 2013 Honda Accord, plus a 2 night vacation package for four to Disneyland® Resort including one night in the Disneyland® Dream Suite. Visit https://hondaaccorddream.com/ for your chance to win, and don't forget to stop by Pacific Honda to test drive the all-new 2013 Honda Accord. for four to Disneyland® Resort including one night in the Disneyland® Dream Suite. Looking for a fuel efficient car with a versatile, spacious interior? 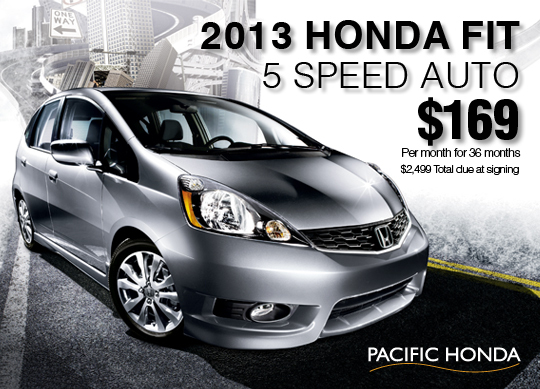 Stop by Pacific Honda and ask to test drive the all-new 2013 Honda Fit. Saving money just got a whole lot cooler!! Pacific Honda has been your leader in New Car & Certified Pre-Owned sales since 1993. Come in to test drive the 2013 Honda Civic EX Sedan, and shop with the dealership that gives you the best deals at the best price. The 2013 Honda Accord: All.About.You. It's not often that a major automobile manufacturer debuts a brand-new concept at the Montreal International Auto Show – mostly because it takes place concurrently with the massive show in Detroit – but here we are with the so-called Honda Gear Concept Study Model, which was just uncovered by our friendly neighbors to the north. According to the automaker, the Gear "demonstrates Honda's innovative approach to providing the automotive answer for young, urban, Gen-Y lifestyles. Inspired by fixed-gear bicycles... Gear is simple and utilitarian, but also customizable, connected and full of personality." It is apparently "practical but fun, customizable, connected and affordable. Everything that young, discerning urban buyers would want in a car," according to Dave Marek, Design Director at Honda R&D Americas. We don't know anything else – what might lie underhood, how it is "connected" or at what price point it might potentially be sold at. Check out our high-res image gallery above and the press release below and you'll know just about as much as we do. 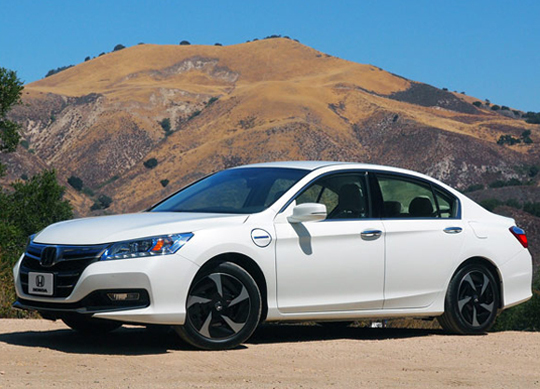 Have you seen the amazing & efficient, all-new 2014 Honda Accord Plug-In? Click this link and check out the MPGe rating that will change the future. Next up on the 2013 Detroit Auto Show embargo-break-a-palooza: the Honda Urban SUV Concept. 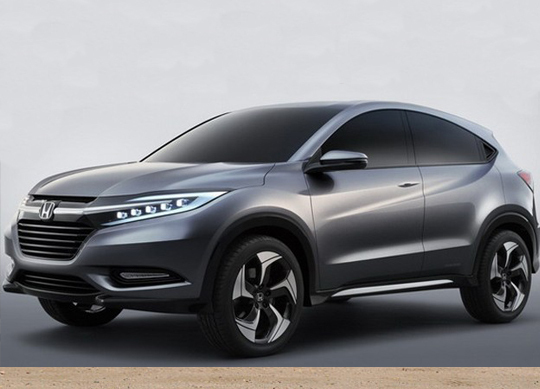 Thanks to Indian Autos Blog, we now have the first press shots of the small crossover concept – a vehicle that will someday make it to production, riding on the Honda Fit platform. It may have some big features – namely, the large headlamps, big wheels, and bold body lines – but the Urban SUV Concept will compete with smaller vehicles like the Nissan Juke or Fiat 500L. 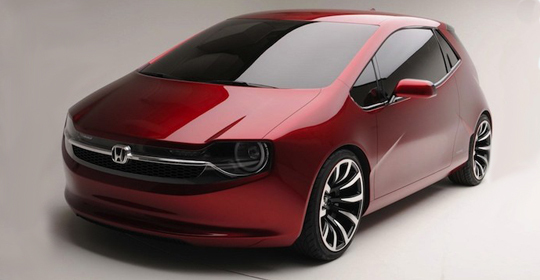 Indian Autos Blogreports that both 1.6- an 1.8-liter four-cylinder engines are being speculated for use in the production model, as well as a diesel powerplant for foreign markets. That's all we know for now, but stay tuned to see the full smattering of official images and details as part of this week's Detroit coverage. Honda has announced that it will invest $23 million in its Marysville, Ohio facility to support production of the upcoming 2014 Accord Hybrid sedan. According to the manufacturer, this means approximately 50 new jobs will be created, and the whole investment will result in a 95,000-square-foot expansion of the Marysville plant. The Accord Hybrid joins the decidedly homely Accord PHEV (pictured) this fall, using a 2.0-liter i-VTEC Atkinson cycle four-cylinder engine mated to a 124-kilowatt electric motor. 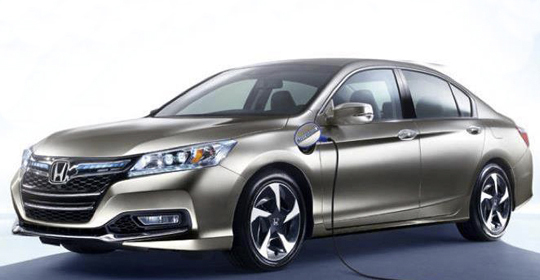 Honda has yet to release official power or fuel economy figures for the non-plug-in hybrid version of the Accord. Honda currently operates four manufacturing facilities in Ohio, with the combined capacity to build up to 700,000 cars and light trucks each year. The Japanese automaker also has a facility in Greensburg, Indiana, where the Civic Hybrid and Acura ILX Hybrid are built.